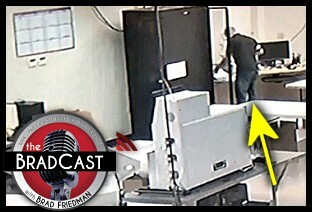 " Arizona Election Official Caught Breaking Into Vote Tabulation System: 'BradCast' 11/2/2015	"
« PREVIOUS STORY "Sunday Ghoulish Toons"
"Arizona Election Official Caught Breaking Into Vote Tabulation System: 'BradCast' 11/2/2015"
Thank you Brad and Desi for having me on. Many on the very top in the 2 party system really don’t want change. The “status quo” works well for them. I learned that Election Fraud in most cases is done with “impunity”. Our job as citizens is to organize and take that impunity away by knowing and enforcing the existing election laws, then utilizing our rights of oversight as Electors, Candidates, and sometime with political parties. Making our election folks and any hackers a little paranoid is good thing. As election transparency activists on the brink of our fifth presidential election cycle for this century, supporters of election integrity are astonished that this country intends to conduct this upcoming election with the same old equipment that lacks adequate security and can be hacked with ease. Worse, we are unable to inspect durable verifiable paper ballots of record in many states. What we’ve learned since 2000 is simple: Elections must be Transparent and Verifiable and anything less is unacceptable. In a few months, U.S. citizens will again attempt to exercise their most fundamental right to vote in the upcoming presidential primaries and as Brad would say, "We need to keep our eyes on the track conditions!" I find that election fraud is more prevalent in primary. The system is rigged 1st by gerrymandering, manipulating the boundaries for one of the two established parties. Our current predicament: The Help (Hack) America Vote Act (HAVA), our voting system was developed around a failed concept known as “Security by Obscurity”. The idea is that security is inherent in the use of secrecy over the design or implementation of the system. Well secrets don’t last forever, so everyone in the election industry knows hacking is as easy as opening the database in the common program, Microsoft Access. One can even use this access program to delete or change entries in Diebold’s GEMS audit log without detection. See Ibeta report [PDF]. “Security by Obscurity” ultimately became the handy rational for skirting transparency. According to our long time Attorney Bill Risner: “Every study of the security of computer voting systems has identified insiders such as company employees and or vendors and election department employees as the primary security risks and these same vendors when having their software certified instructed the test labs NOT to check the software for security.” Video Risner in court - Truth to Power. Las Vegas slot machines have far better security. Most of the public is unaware that our elections are vulnerable to vendors, programmers, memory card viruses or other security breaches. A Great Tool Nationally - Verified Voting’s Verifier. “So Who Programs Your Elections?" In many cases it’s not who you think! “That's why we must have software verification with two parts: Transparency and Oversight” which as we know in Arizona, neither exist. “Transparency means making the source code available for analysis. The need for this is obvious. It's much easier to hide cheating software in the manufacturer's code. Cheating on regulatory testing has a long history in corporate America.” By CNN Bruce Schneier. "VW scandal could just be the beginning”. And it is! John R. Brakey of Americans United for Democracy, Integrity, and Transparency, Arizona & Special task force leader for Citizens Oversight for Verifiable Elections. DRE- Direct Record Electronic. A Voting machine with a touchscreen that voters use to select choices and cast their votes. Only some DREs have paper trails, the Voter Verified Paper Audit Trail that is a paper record of the ballot, shown to the voter before the final Cast Vote choice is offered onscreen. The paper is not a receipt; it stays in the machine for use by elections official if audits are required or recounts are requested. AUDIT – A second count of a percentage of ballots to statistically prove accuracy or error in first results. Done post-election, but not everywhere. Some states have no mandatory audit laws. Methods of audit count vary by voting system, state law, and county practice: hand-counts of paper ballots or paper trails; re-running paper ballots through original opti-scan software; re-aggregating memory cards from a percentage of DREs; looking at a percentage of DRE computer audit logs. RECOUNTS – A complete re-count of ballots in a race. Again, count procedures vary by system & state & practice of county election officials. AUDITABLE – Elections that can be proven accurate by a public, visible, transparent counting method. INAUDITABLE – Elections without a publicly observable method of counting to prove accuracy of results. TS – Touchscreen, the computer screen on DREs that voters use to make selections and cast ballot. VVPAT – Voter Verified Paper Audit Trail. The paper version of the digital ballot cast and counted on a DRE. Not all DREs have VVPATs. Editor’s note: LA Registrar Connie McCormack quit her position in part because Secretary of State Debra Bowen required, after a top-to-bottom review of CA voting systems, that Diebold DRE counts, used in LA’s Early Voting, had to be determined from counting the paper trail, not the vulnerable software. McCormack complained that the curly thermal papers were too difficult to handle – a problem election integrity activists had warned about all along. DRE w/o VVPAT – Direct Record Electronic machine without Voter Verified Paper Audit Trail. Their results are publicly INAUDITABLE. DRE w/ VVPAT – Direct Record Electronic machine with Voter Verified Paper Audit Trail. Digital results are AUDITABLE by paper trail. But research shows voters don’t always check the accuracy of their paper trail before touching the screen to cast their vote and walk away. OPTI-SCAN - Computerized scanners that move ballots fast through software counter. Opti-scan results are publicly AUDITABLE by a publicly observed hand-count of the paper ballots. This method deters fraud and catches mistakes, minimizing the risk of dishonest outcomes but only in states where manual audits are mandated. Thanks for the coverage and kind words for the film. Elections fraud is a tough issue to cover and you do it well. Thank you John R Brakey. You are definitely in the top tier of election integrity activists in this country. Your tenacity is unbelievable! The first sentence of your comment here has become obvious over the years, starting with HAVA. "Many on the very top in the 2 party system really don’t want change. The “status quo” works well for them." No Democrat should have ever supported that legislation. The superior transparency of the slot machines is never a bad thing to bring up in this ongoing charade. PIma County Election 2015 Bonds failed because of no trust in Pima county officials or Tucson City council member and Huckelberry lier pie. This is from a Navy Retired Man W.J.V. III GM1(SW) USN retired. We the people won this one in Tucson, AZ! We made our votes count. All 7 county bonds crashed and burned like no other bond election. All 7 county bonds crashed and burned. The pundits were surprised by the losses! “All seven bonds trailing, leaving backers ‘stunned'"
Even though several pundits privately voted against the bonds, publicly predicted, thinking that County manager Huckelberry was going to fix the results as what happen in the last bond election for $2 billion. How we stop them. We took away their “impunity” to steal! We were on top of them and caught them breaking into the central tabulator. After all, as citizens we have the right still to organize still, take that impunity away by knowing, enforcing the existing election laws, then utilizing our rights of oversight as electors, candidates, and sometime with political parties. Building non-partisan coalitions thus making our election folks and any hackers a little paranoid is good thing. This is now 3rd for 3 elections that this has worked. Impunity busting! I feel we are sitting ducks in our elections. Insiders (elected and non-elected officials who control the machinery of our elections) have all the power, access, and control of ballots and totals during the regular business hours and into the dead of night. They can very easily tamper with results of our elections. And even when "losing" candidates have the courage and the stamina to PROVE they won (Clint Curtis, FL), this proof comes after-the-fact when the actual loser has already been crowned and no one in power is willing to overturn the reported results. Dead giveaway fraud- as when results run counter to the polls as in the recent Kentucky election- instead of triggering a hand-recount of the ballots- is handled by the media by massive attempts to discredit the POLLS instead! We need MORE polls- run by MANY interested parties, and we need a national group that responds to such suspicious mismatches between expected results and reported results in our elections by demanding and conducting the hand-counted recount, via immediate confiscation of the suspicious ballots. After years of watching and participating in election integrity efforts, it is very discouraging that there is yet no national group with the power, finances, and visibility to effectively counter the national shame of insider election fraud. I congratulate Mr. Brakey on his stellar victory! Is there no powerful, well-financed public figure who could take this on as a national project? This is a cry for help!